On the fifth day of the walk, the walkers toured the Carton House estate of Lord Leinster near Maynooth, where the “Famine Queen” Victoria and Prince Albert visited in 1849. Professor Christine Kinealy, founding Director of Ireland’s Great Hunger Institute at Quinnipiac University, writes about Queen Victoria’s visit to Carton House. Queen Victoria remains a controversial figure for her role during the Great Famine. The widespread belief that she made no financial contribution to assist her starving subjects in Ireland meant that she is widely remembered as ‘the Famine Queen’. The reality is more complex as Victoria did intervene in a number of ways to assist Ireland between 1846 and 1852, mostly though, at the prompting of the Prime Minister, Lord John Russell. In 1845, when the potato blight first appeared in Ireland, Queen Victoria was aged only 26, married with four young children. She had never visited Ireland and showed little interest in doing so, which was in strong contrast with her love for Scotland. The second failure of the potato crop in 1846 meant that Ireland became a major concern of the British government and its nominal head, the monarch. This was evident in the Queen’s Speech marking the opening of parliament in January 1847, when she stated that ‘the loss of the usual food of the people has been the cause of severe sufferings, of disease, and of greatly increased mortality among the poorer classes’. In the same month, she issued a ‘Queen’s Letter’ calling on Anglican churches throughout the United Kingdom to donate to Ireland, and to observe a day of special religious services to pray for forgiveness. The latter action reinforced the idea that the potato blight was a punishment from God. This providentialist interpretation of the potato failure was prevalent amongst a number of politicians and relief officials, notably Charles Trevelyan of the Treasury. Privately, however, the Queen believed such actions to be irrational and had only called for a day of fast at the request of her Prime Minister. On a more practical level, at the beginning of 1847 Victoria donated £2,000 to the newly formed British Relief Association, with a promise of more if necessary. Other members of the Royal family also donated to the Association. Additionally, the appeal by the Queen to the Anglican churches had been successful, raising almost £172,000. A small portion of this money was used to help the poor in Scotland who had also lost their potato crop. In October 1847, when it was evident that a third year of famine was inevitable, a second Queen’s Letter was issued, but it raised only £30,000, indicative of the onset of compassion fatigue in regard to helping Ireland. In 1848, the potato crop was again struck by blight, although it was most severe in the west. 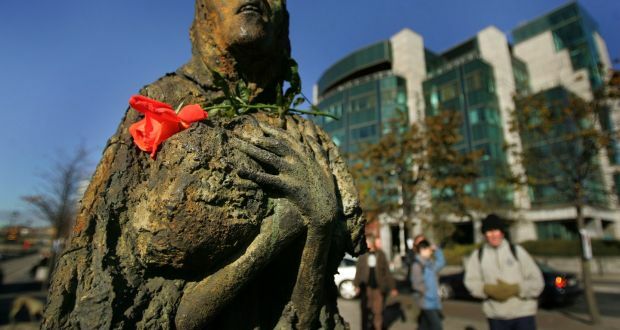 At the beginning of the following year, the British government made a small grant to Ireland on the understanding that it would be the final one, regardless of the suffering still evident in the country. In June, as disease and death were showing no signs of abating, the Queen and a number of her ministers made small donations, but the amount raised was pathetically inadequate given the extent of the distress. Around the same time, it was announced that Victoria was going to undertake her first visit to Ireland. Victoria’s only inland visit came when she was in Dublin, staying in the Vice-Regal Lodge in Phoenix Park, the home of the Lord Lieutenant. On Saturday 11 August, she visited Carton House and Estate, the ancestral home of the Dukes of Leinster. Wearing a dress trimmed with Limerick Lace, she travelled there in an open barouche, along the banks of the Liffey. People, included large numbers of the ‘Irish peasantry’ lined the route. When she reached Maynooth, the students of the seminary lined the streets, dressed in their college regalia and cheered as she passed. Thousands of other people had come to the town by train, carriage or on foot. The Queen entered the estate through Kellystown Gate. Shortly afterwards the royal party and about 40 guests, including the President of Maynooth College, the Rev. Renehan, sat down to ‘partake of a magnificent dejeuner’. While they ate about 160 people were given refreshments ‘of the most varied and costly kind’ in tents erected in the grounds of the estate. At the Queen’s request, a large number of locals including ‘numbers of peasantry’ had been invited to observe her walking about estate. Following the walk, the guests were shown ‘a real Irish jig, which was danced to the music of an Irish piper by a number of the Duke’s tenants and their wives and daughters’. The bagpiper was Sheridan from Kilcock. The press reported that the Queen ‘laughed most heartily at the performers and the royal party seemed to be highly pleased with them’. After visiting a thatched cottage on the estate, the Royal party left for Dublin. Contrary to popular lore, she did not spend the night in Carton House. Victoria arrived back in the Phoenix Park shortly after 5.00pm, only staying for about thirty minutes. When she left, she travelled to the railway station in Westland Row, taking the train to Kingstown (Dun Laoghaire) where the royal yacht was docked. Again, the route was packed with people, and the bay was filled with vessels, with everybody appearing delighted to catch a glimpse of the Queen. Any disgruntlement that existed was eclipsed by the cordiality of the majority of the people. John Mitchel, who at that stage was thousands of miles away, on a prison ship and therefore unable to witness the occasion in person, nonetheless wrote about the royal visit and attributed the warmth of the welcome to the natural kind-heartedness of the Irish people, together with the Lord Lieutenant’s careful precautions to render any dissent invisible. The Queen’s visit to Carton House in 1849, and the feasting and festivity that accompanied it, gave no indication that, simultaneously, a famine was still raging in parts of the country. Regardless of her interactions with Ireland during these years, Queen Victoria reigned over a government that increasingly turned its back on Ireland, which resulted in the most lethal and devastating event in Irish history that continues to have repercussions today. In that sense, she truly was the Famine Queen. Queen Victoria, pilloried in folk memory as the ‘Famine Queen’ who only donated £5 in famine relief, in fact donated £2,000 to the British Relief Association in January 1847, making her the largest single donor (multitext project). Like Queen Victoria and Prince Albert, the famine walkers visited the Carton House estate’s Tyrconnell Tower, which was refurbished in the nineteenth century, in folk memory as a famine relief project. On the final day of the walk, the walkers passed the spot at Clonsilla bridge where sixteen people lost their lives at the onset of the Famine when the Dublin to Longford passenger boat capsized on 25 November, 1845. This deplorable accident and inquest are described in the Cork Examiner and Pilot below. The story of the 1490 is one that has been reconstructed from the treasure trove of documents found in the Strokestown Park Archive. An extract from the Cloonahee Petition, 1846, Strokestown Park Archive. ‘The Strokestown Park Archive represents a jewel in famine studies, and one that has great significance beyond Roscommon and the island of Ireland’. The collection containing over 55,000 documents is of international significance in relation to the Famine period and also a complete record of economic, social, and estate history over a 300 year period. A dedicated environmentally controlled archive room has been created above the stables and a study centre within the stable wing is being created. The Famine walkers began the fourth day of their journey at the Robinstown famine graveyard in Mullingar. Former union workhouse graveyard on irregular plan, used between c.1840 and c.1860. Now out of use. Cut stone gateway to the southwest side having a pair of wrought-iron gates. Located to the north of the former Mullingar Union Workhouse complex and to the north of Mullingar. This graveyard largely contains the marked and unmarked graves of victims of the Great Famine (1845-9) and acts as a poignant reminder of this traumatic event in Irish history. The good quality cut stone gateway to the southwest adds a touch of dignity to this otherwise largely neglected site. At the end of the third day of the Famine walk the walkers reached Mullingar and visited the Mullingar workhouse. According to Seamus O’Brien, the “Mullingar poor law union was one of the largest in the country. The union workhouse, which was situated on the northern outskirts of Mullingar, admitted its first paupers in December 1842. Designed to accommodate 800 inmates, it struggled to cope with double this number at the height of the Famine” (Carn, Killare: A Forgotten Westmeath Famine Village (Rathlainne Publications, 2000, 9). Mullingar workhouse site, 1914.© Peter Higginbotham. Mullingar workhouse site general view, 2000. © Peter Higginbotham. Mullingar entrance block, 2000. © Peter Higginbotham. Mullingar workhouse entrance and date-stone, 2000. © Peter Higginbotham. Carn hill Famine village ruins. On the third day of the walk the walkers past through the more remote parts of Westmeath along the Royal Canal. In Famine & Community in Mullingar Poor Law Union, 1845-1849. Mud Huts and Fat Bullocks (Dublin: Irish Academic Press, 1999), Seamus O’Brien notes that the villages in the Killare area along this stretch of canal were particularly devastated by the Famine, and that “throughout the union generally the appearance of the population was wretched. Their clothing was in rags” (24). “The biggest losses here occurred,” he adds, “in the southwestern districts of Castletown and Killare where 53 and 40 percent of their respective populations either died or emigrated between 1841 and 1851” (48). Near the Royal Canal are “the ruins of the Famine village on Carn hill and the now fossilized lazy beds which supported it” (56). This area of Westmeath belies the usual depiction of the county as a typical part of the central plain of Ireland with its limestone solution lakes, rolling pastureland and extensive raised boglands. The area west of Mullingar is quite hilly. Historic Usnagh hill with the famous “Catstone” erratic on its southern flank, is justifiable the most famous of these limestone hills. Directly opposite Usnagh is Carn hill, a structural limestone fold which has an average elevation of 600 feet above sea level. Famine village cabins, artist rendering. The Famine village was in a sheltered central location near the summit of the hill… The skeletal remains of the many stone houses still visible on Carn hill today, as well as being evidence of the last and seemingly final human settlement in this area of Westmeath, are a poignant reminder of the economic pressures experienced in this region during the Great Famine” (9-10). Map of Carn Hill Famine village.